Manufacturer of extenders, KVM drawers, A/V matrix switches, KVM switches & video splitters that are world-renowned for their exceptional quality, reliable performance & innovative technology. 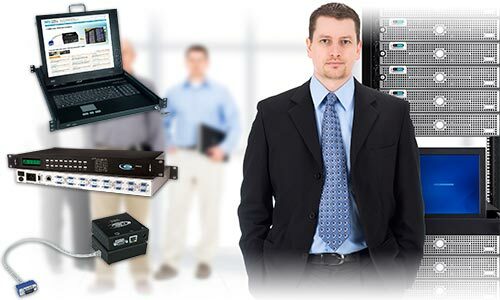 Network Technologies Inc (NTI), founded in 1984, is a leading manufacturer of high quality IT and A/V solutions. NTI products are used worldwide by leading companies in every industry, including manufacturing, retail, government, education, healthcare, financial services, entertainment, worship, broadcast, and telecommunications. NTI is a privately-held company with an excellent credit history and industry reputation. Its products are designed, manufactured and tested at the company headquarters in Aurora, Ohio, USA. The company's product line includes enterprise environment monitoring systems, video processing multiviewers, extenders via CAT5, audio/video matrix switches, KVM switches, console switches, and more. NTI rapidly introduces new products with state of the art technology to meet the ever-changing market demands. Most new products use an embedded Linux Operating System. Lower-cost solutions are constantly being evaluated to determine how to best meet customer needs. NTI is dedicated to delivering solutions that are of exceptional quality, reliable performance, and innovative technology. The company has implemented quality assurance systems and processes that are constantly being improved in order to meet or exceed customers' expectations for product quality, product performance, and timely delivery of products. Examples of the company's quality processes include using only the finest components, strict manufacturing and inventory management, properly training personnel, and keeping up with the latest in manufacturing technology. Environment Monitoring Systems Monitor and manage environmental and security conditions over IP. Provides early warnings before critical events turn into disaster. Monitors threats: temperature, humidity, water leakage, power, intrusion, and more. Quad Screen Multiviewers Simultaneously display real-time video from four different video sources on a single display. Extenders via CAT5 Place control where you need it - up to 1,000 feet using CATx cable. USB, Video and KVM extenders are available. DVI Matrix Switch Route video from up to 32 single link digital DVI video sources to up to 32 displays. KVM Drawers Provide space-saving convenient control in 1RU of rack space. Available with a hi-res 1920x1200 17.1" LCD. High Density DVI USB KVM Switches Control up to 32 single link DVI USB computers with one USB keyboard, USB mouse & DVI monitor. SSH Secure Console Switches with Environmental Monitoring Securely control up to 32 serial devices via Ethernet, LAN or dial-up modem connections. 4K DVI/HDMI Video Splitter Simultaneously display the same Ultra-HD 4Kx2K image from one DVI/HDMI video source to two displays.